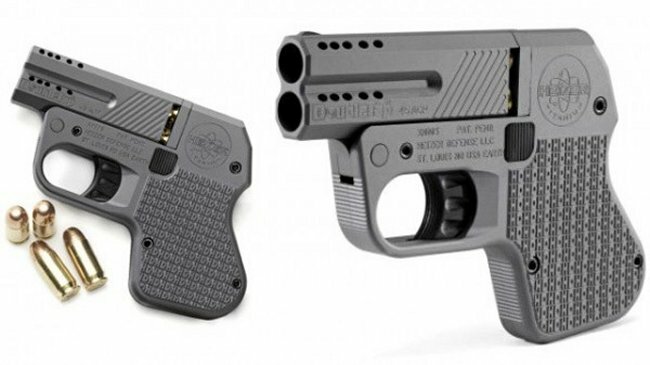 DoubleTap is a .45 caliber pistol from Heizer Defense and it just happens to be the world’s smallest .45. It measures 5.5″ long, 3.9″ tall and weighs just 12 or 14 ounces depending on whether we are talking the aluminum or titanium versions. You would have to go with the titanium version though. It’s just cooler. At this size it won’t hold many bullets. Just two in the over-and-under barrels and another two in the handle. It’s compact, lightweight and if you are any kind of a good shot, these are all the bullets you will need for your mission or just to protect yourself. Considering that it is the world’s smallest, $500 for aluminum and $700 for titanium is a good price. I would guess this one is more about having a hidden defense than doing any serious shooting though.